Do you struggle to get your mixes to sound as powerful, catchy, loud, interesting and "ready" as the music from your favorite records? Are you an artist or producer who is required to deliver finished tracks, but with limited budgets? Would you like to get your music to sound at its best before committing to a top-notch mastering studio? If the answer to these questions is: "I want free snacks and drinks", this event is for you! But seriously: join the event, submit your track and get it mastered in real-time, in front of you! In the unique style and approach that made Fuseroom famous, Alberto Rizzo Schettino will go all-in on what allows him to receive mastering jobs on a weekly basis. From rock to electronica, jazz to reggae, Alberto has been regarded as one of the most no-strings-attached, clear-minded and focused engineer to face the mastering phase for a multitude of independent and signed artists but also receiving explicit requests from other producers and engineers asking him for private tutorials in the attempt to achieve his same sonic results. 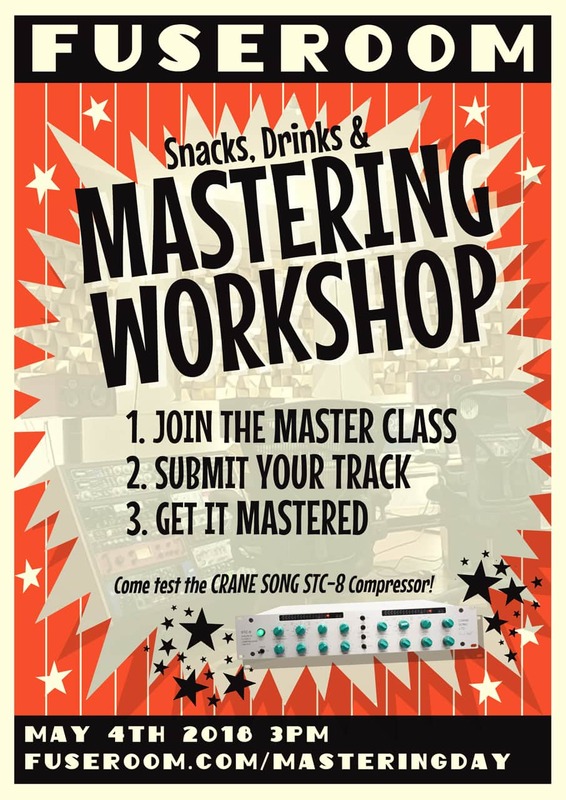 Once you join the master class, you will be able to submit your own track for being mastered at the event! Alberto will analyze your music, give you inside tips and suggestions on how to make it sound better and improve it in the mastering phase, following his hybrid analog and digital approach with the best outboard and digital plug-ins available on the market today. Like the result and want to take the mastered file with you? Awesome! You'll benefit from a 30% discount on our normal mastering rates! Join the event now by filling the form in this page!